Hi Everybody! I'm posting this one for the Muse Challenge #206 and the inspiration card is from Anita Bowen. My interpretation on Anita's card was how nicely the background stamped and the flowers were colored and found a stamp in my stash that had the same idea. I've not used this one for years and I'm glad I found it again! I stamped this twice onto some white bristol paper and colored it with some zig clean color markers. I cut out a few of the flowers from the second panel and used it to pop them up from the little frame. Lastly I stamped the sentiment on a tag and gold embossed it- used black cardstock to make a 4-1/2 x 4-1/2" card. This is so beautifully dramatic! So glad you joined us at Muse this week! Hi Mary, thanks so much for your lovely comment. I LOVE your take on this week's MUSE card. It's so beautifully striking, and a clever idea to add that dimension. Wow! What gorgeous poppies, Mary. Bold and beautiful. Great design too. Very well done. Gorgeous card, Mary. 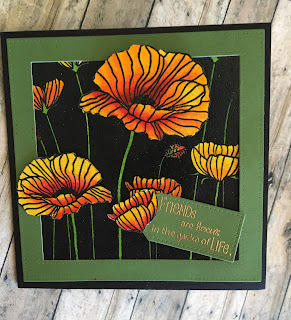 Love the yellow/orange poppies against the black. The green frame is perfect. Wonderful interpretation of Anita's card. Stunning -this is one of my favorite Hero Arts stamps! Love your colors choices! Beautiful card, Mary! I love the way you have popped up some of the poppies! Your card is beautiful. Your orange, green and black colours work so well together with the bold poppy flowers. I love how you have done this card, I would never have thought to use the stamp like this. I always go white, so have to try it. Your colours are so vibrant against the black. Stunning. This is so great. I love how you stamped the image twice to add dimension to your card. Great interpretation of Anita's Muse card. So glad you were inspired by my card. Loving the sunny orange against the bold black. I cannot figure out a way to thank every one of you individually for the lovely and appreciated comments, so I'm hoping you'll see it if I post it this way...I'm very new to blogging, but THANK YOU!! What a wonderful thing to be a part of!